MCA Assistant Teacher Recruitment 2019:- Latest Update 28 July Allahabad high court has rejected hearing of Candidates who are MCA Degree holder to apply for computer teacher vacancies in LT grade, Primary Teacher. 1. 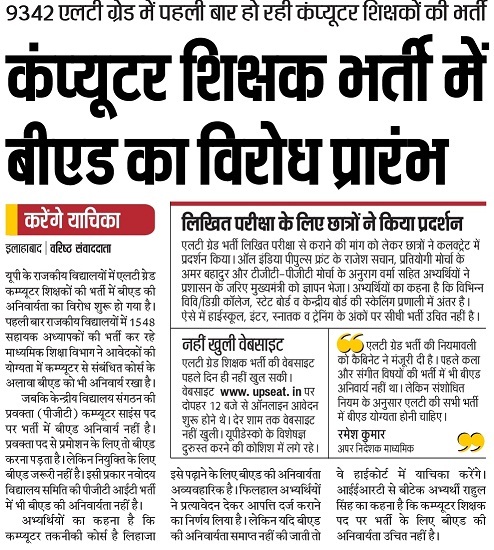 Allahabad High Court said only NCTE approved course is eligible to fill form of Computer Teacher. 2. The Important Computer Courses are BCA, PGDCA, B.sc, B.tech, A Level Computer Course are eligible. 3. MCA Degree is not eligible to apply for teacher related to government. 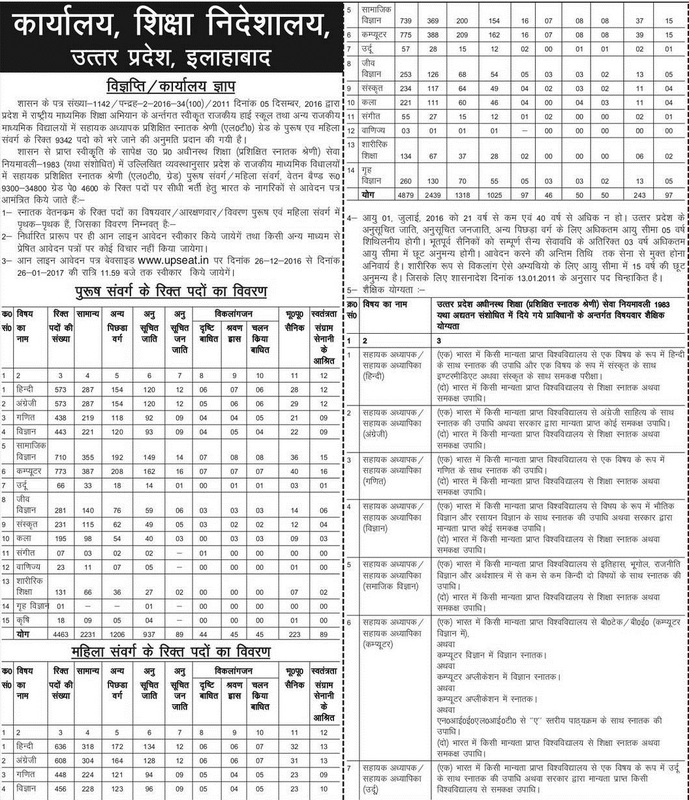 Minimum Age Limit/Experience and Qualification for Uttar Pradesh Computer Teacher Recruitment 2015 : Applicants should have 10+2 with JBT, B.Ed, Four-year Degree, Post Graduate M.Sc Course, BE, B.Tech, M.Sc, MCA, B.P.Ed, Bachelor degree, BCA Equivalent and attained minimum of eighteen (18) years of age. The date of the interview date is soon updated by 9.00 AM. The official advertisement is announced from 2018. UP Lt grade Teacher Last date will be extended in 9342 LT grade teacher and see more update on total candidates who have applied. Click here to check latest news 9 February 2017. 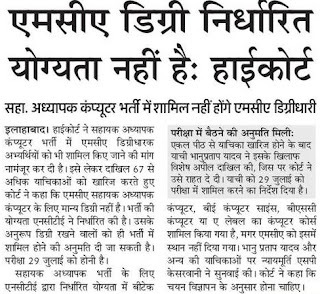 UP LT Grade Computer Teacher Latest News Update 27 December 2016: upseat.info Recruitment was started on 26 December but due to heavy traffic site may not open. 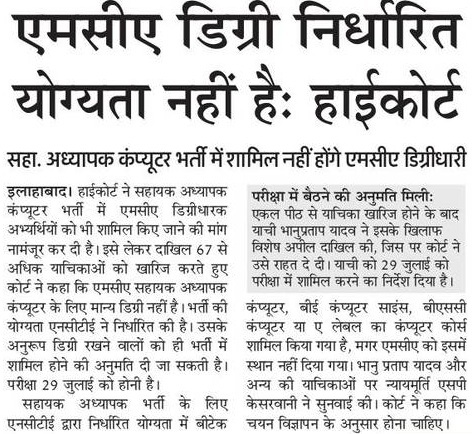 But for LT Grade computer teacher vacancy Objection is take on Qualification to apply computer teacher vacancy. Which is Listed below. 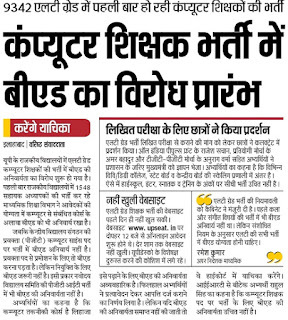 Various Candidates Raised Objection on computer teacher bharti that is in Kendriya Vidyalaya Sangathan computer science posts main eligibility is Graduate Pass or PG related to computer But Not BED. Navoday Vidyalaya Samiti Recruitment of computer teacher (PGT IT) BED is not mandatory. Total : 4463 Male : General : 2231, OBC : 1206, SC : 937, ST : 89. Total : 4879 Female : General: 2439, OBC : 1318, SC : 1025,ST : 97. UP 4000 Computer Teacher Vacancy 2016 UP Basic Shiksha Education Board is managing a 4000 computer anudeshak recruitment presentation this bharti is part of to select Forty One Thousand Three Hundred & Seven (41307) disciplined and frank work seekers having Indian citizenship as the position of Part-Time Instructors in the area of Health & Physical Education, Computer Education, Gardening Science, Art Education Teacher, Work Education, Home Craft and Agriculture Education all these vacancies in Uttar Pradesh. 1548 UP Rajkiya Inter College Computer Teacher Recruitment 2016: total vacancy is 1548 sidhi bharti 773 posts for male and female 775 posts which is for cumputer teacher as subjects. UP 1548 Computer Teacher Recruitment will be opened in LT Grade teacher 9342 and filled in Rajkiya Inter College. Latest News: 21 December 2016. Selection Process: Written exam, Interview, computer typing test candidates will be shortlisted as per marks obtained by him in earlier educational career. After that, only eligible candidates will appear for a personal interview. Name & Number of Posts to be filled in UP Teacher latest news 2016 : UP Kendriya Vidyalaya Sangathan, UP Ordnance Factory, Eddumailaram, Medak PRT, Post Graduate Teacher, Computer Instructor, Coaches for Games & Sports, TGTs (Sanskrit, Science, Hindi, Social Studies, Math, English), PGT (Computer Science), Vocational Instructor for Dance & Music and Spoken English Instructor. What are important dates and website to fill application. How to apply for this post and what is tha last date of applying ? Max kiti merit ja sakti computer techer ke lie .as per your point of view. sir how can we register?? ?plz provide link for registration??? sir i had completed Msc computer science ..i am eligible or not?? what is the link to apply for 1548 computer teacher ? But sir adv me to degree show hi nahi kar rahi hai. The URL itself is not opening.. Can you please let me know how to apply or when it will begin to work? I have done b.tech in IT.Can i apply for computer teacher? But i have not done b.ed.B.tech is already professional course.So is there any requirement of b.ed?